Visual data mining, as an art and science of teasing meaningful insights out of large quantities of data that are incomprehensible in another way, requires consistent visual data representations (information visualisation models). The frequently used expression "the art of information visualisation" appropriately describes the situation. 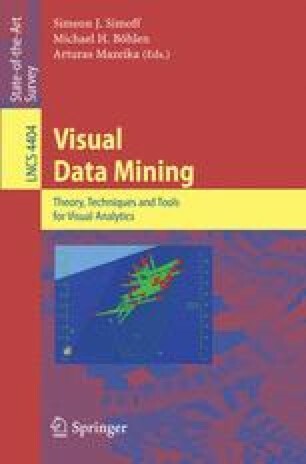 Though substantial work has been done in the area of information visualisation, it is still a challenging activity to find out the methods, techniques and corresponding tools that support visual data mining of a particular type of information. The comparison of visualisation techniques across different designs is not a trivial problem either. This chapter presents an attempt for a consistent approach to formal development, evaluation and comparison of visualisation methods. The application of the approach is illustrated with examples of visualisation models for data from the area of team collaboration in virtual environments and from the results of text analysis.